I came up with this recipe one night for dinner and my husband and family loved it and it has become a regular for us. 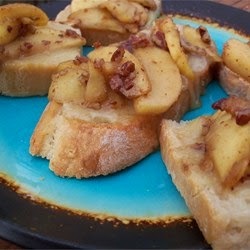 The combination of spiced apples and brie cheese is amazing. Great served with a spring lettuce salad. You can also make this as an appetizer by using a baguette loaf instead of sourdough slices.